Tours of the art studio are available by appointment for groups of up to thirty people. 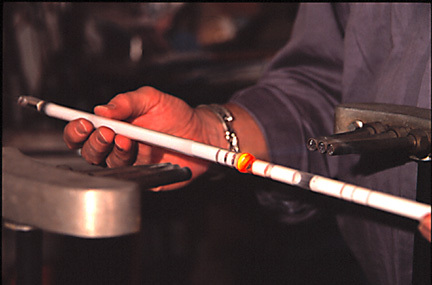 Included are demonstrations of how neon tubes are made as well as informative discussions as to how neon lights work and other technical aspects regarding the neon sculpure, all catered to meet specific audience needs. Other demonstrations include showing how the aluminum is cut, bent and finished and glass fusing and slumping in hot glass kilns. Lectures on contemporary neon art and workshops on the design and construction of neon lighting and sculpture are available for professionals, artists and laymen. Unfortunately, Ehlenberger does not have the time to teach full courses in neon bending.